Intelli-Search-Xpanded: In addition to the V_SRCH design features described in the VisionPak-Xtended Tool Set, Intelli-Search is extended to allow actively running queries from the search design window. 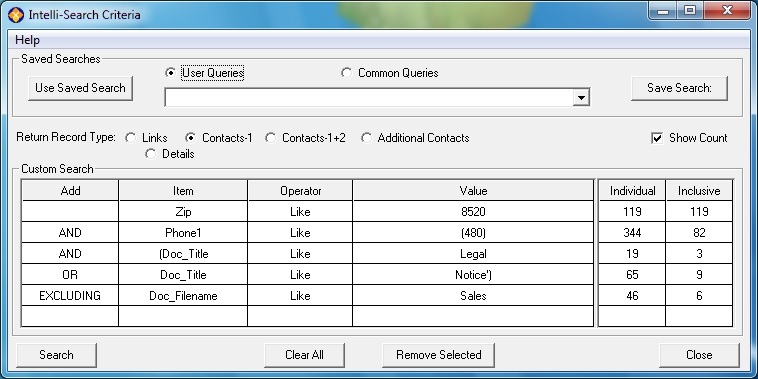 The results of these searches can then be used to create reports, and also as the basis for creating GoldMine Contact Groups with the Intelli-Group, feature. These added features of Intelli-Search also simplify and significantly expand data mining and analysis. For example, they provide instant access to Contacts based on non-Contact data, such as information from Document and Detail fields' criteria. By making this criteria more accessible and useful, GoldVisionPro expands the value and uses of the GoldMine system! During search-design and prior to running the search to return records, the Show Count display can be activated to indicate the contribution of each criteria. Each user can Save search criteria for future personal use [User Queries], or generally for broader Common-user access [Common Queries]. As Common Queries can be incorporated in custom Intelli-Processing, this window provides a convenient and easy-to-use test area for evaluating query results, prior to incorporating them in process design. Custom Record Values: In order to take advantage of GoldMine's abilities to trigger automated and other processes based on designated record values, GoldVisionPro has developed the Custom Record Values functionality. This customizable feature enables Administrators to create and implement specific History and Link record values in their file linking process. Stand-alone items can be independently set to any available value. Interactive items present the user with specific additional choices based on their previous selection. Typically in an interactive setup, selection of an Activity Code then defines the specific Reference Values available. 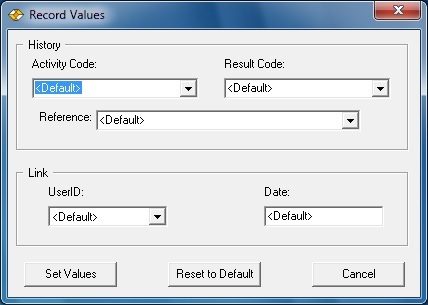 Selection of a Reference Value then defines the specific Result Codes available. User-Selected in the Record Values window; configurable to require selection before proceeding.